Visibly reduces fine lines and wrinkles, even the deepest. DESCRIPTION: Pro-Correct Anti-Wrinkle Fluid from RoC is a light fluid that helps visibly reduce lines of expression and wrinkles, even the deepest. Moisturizes while visibly reduces wrinkles and fine lines. Provides a matte effect and concealer. 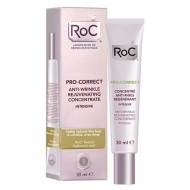 Ideal for normal to combined skin with wrinkles. 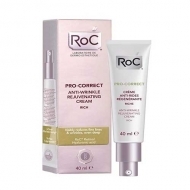 Contains Roc Retinol that stimulates cell regeneration and collagen production; Hyaluronic acid that fills deeper wrinkles; Intense cocktail that attenuates signs of deep aging and prevents wrinkles. Fluid formula, quickly absorbed. Adapt the frequency of application with the sensitization of the skin.